There are currently twenty-three states and the District of Columbia that have enacted laws legalizing marijuana for medical use. In addition to allowing medical patients to use marijuana for debilitating health conditions, Colorado, Washington, Oregon, Alaska and the District of Columbia have legalized marijuana for recreational use. Colorado and Washington have also implemented licensing rules and regulations for retail marijuana businesses that can sell marijuana for recreational use. Other states are developing regulations and plan to begin accepting applications for these types of businesses in early 2016. Although states are taking steps to consolidate the two industries, there are currently differences between medical and retail marijuana in the way it is priced, sold, bought, and the laws that must be followed on order to set up a business. Much more so than medical, the retail marijuana industry is heavily regulated and taxed at both the state and local level. Some cities and counties may have additional license requirements in addition to the state requirements or may have outright bans on retail marijuana businesses altogether. 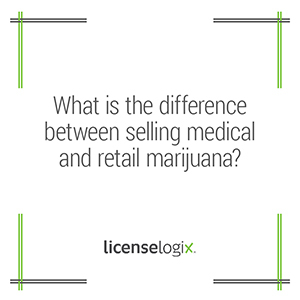 Licensing for both medical and retail marijuana businesses is a movement that LicenseLogix is researching and tracking. Licenselogix can streamline business licensing for you by identifying exactly which licenses your business will need and filing them on your behalf. Contact a Licenselogix representative to start your business today by clicking here or calling us at (800) 292-0909.